The largest cigar in the Rodrigo Box, a vitola I do not smoke very often. But it was a nice day out on the porch and there was nowhere in particular I had to be so I allowed myself the luxury of a very long smoke. 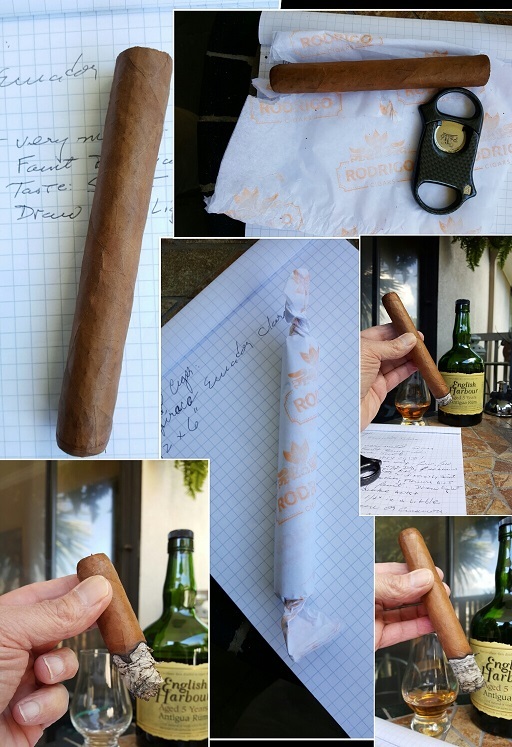 From the picture you can see the cigar is a light brown. I can’t find any seams in the wrapper and there are but a few small veins. The pack is very even and firm. Not a heavy cigar for its size but not a lightweight either. The cold smell is a mild grass and barnyard, neither very strong. The wrapper tastes distinctly salty. A straight cut revealed a very open draw, a little too open for some of my friends, but fine for me if the cigar doesn’t smoke too fast. As I got into the second half of the stick, the draw tightened just slightly, perfect! On light there is a little pepper, but it isn’t at all a peppery cigar until the last third. The initial flavors are sweet, wood, leather, and flowers, but all very faint. Smoke output is great. As the cigar progresses other flavors come into it. I get something like wintergreen, and maybe cinnamon along with a light brown sugar. Pepper is minimal, but the flavors are not at all prominent. Mostly I get thick creamy smoke with only a light touch of flavors. I’m pairing this with English Harbour rum at the moment my lightest rum which I hoped would go with the lightness of the smoke. It does OK, the rum brings out a little more leather in the smoke. In the first third the cigar is on the mild side of medium. As I get into the second half of this, the flavors are all still there but they never become prominent, always just hints. Burn line stays straight, and the cigar smokes very slowly. As I get into the last third the pepper comes up a bit but the other flavors fade back. They pop in once in a while, but mostly its smoke though still creamy, thick, and cool. This is a long smoking cigar. I had to let it go at about an inch and a half as I just wasn’t getting any more flavors, but that was an hour and forty five minutes after I started. The cigar never rises above about medium in strength, but it’s bigger than what I normally smoke and I was a tad dizzy at the end. All in all a superbly constructed cigar with a distinct sweetness to it especially in the first half but always mildly in the background.